Girlia's Cards: Fun In the Sun! I am just so excited to share with you this card. Over at Celebrate the Occasion (CTO) we are celebrating Summer. Your project must have a sun. We look forward to viewing your creation. Please stop by and link your project so that we can stop by and take a peek. Winners for the Partners in Crafting Blogaversary will be posted tomorrow. Thanks again for stopping by. I love your use of the colors on white! Make it all pop out! TFS! Where in the world did you get that cut?! It's so cool!--Pat N.
Now this is my idea of summer fun! SO CUTE! cute card...thanks for always coming by my blog and saying sweet things too! I really appreciate the love! Wow, I love this!! The cut is so awesome and I love all the splashy waves! The background embossing really makes it stand out! So fabulous!! 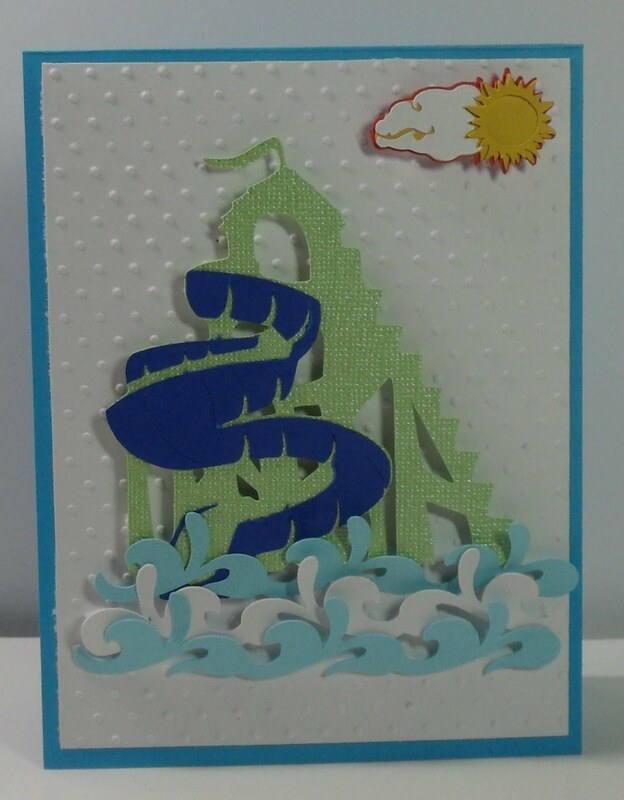 Love-love how you did the water on the beautiful card! Love the water! It's an awesome card! thanks for sharing with us at FCCB!! What a Happy fun challenge. Lovely Card! Thanks for playing with us at FCCB! I love your card! The color combos capture summer! very cute! I nominated you for an award so please stop by my blog to check it out! This is a fantastic card! Very nice. what a great, fun card! Thanks for joining our challenge at FCCB! I LOVE this card! I am disappointed I did not pick up this cart last summer! I'm missing out on so many fun cuts! You did a great job with this one! This is a very fun card! You did a great job! That is super pretty!! I love those cuts! !